As you may have read, Michele Bachmann signed something that said that black families were better off during slavery. Then she backtracked, but her spokeswoman made some weird comments regarding “economic” slavery. And she’s called homosexuality enslavement too. Ooookay, then! Here are the three types (so far!) 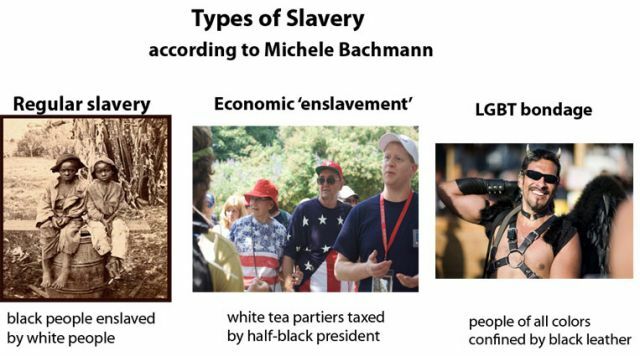 of slavery according to Bachmann. Photo credits: Flickr users marisseay, thirstycactus, OkinawaSoba.